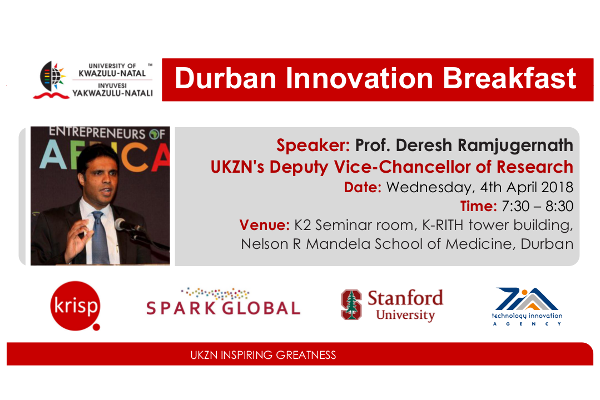 In partnership with Stanford University in the United States, UKZN's KZN Research Innovation and Sequencing Platform (KRISP) will host its 3rd Durban Spark Innovation breakfast meeting on the 4th April at 7h30-8h30 K-RITH Tower Building. The keynote address at the third breakfast is Professor Deresh Ramjugernath, UKZN's Deputy Vice-Chancellor of Research. The keynote address at the third breakfast is Professor Deresh Ramjugernath, UKZN's Deputy Vice-Chancellor of Research who is passionate about driving entrepreneurship and commercialisation of science. Thereby ensuring the transfer of science from the laboratories to the communities. Professor Ramjugernath is the DST/NRF South African Research Chair for Fluorine Process Engineering and Separation Technology, and the Director of the Thermodynamics Research Unit at UKZN. He leads a large team of post graduate students and researchers - arguably one of the leading research groups in its field globally - which undertakes cutting-edge research contributing towards chemical process development and optimization in South Africa and abroad. He and his team have won numerous institutional and national awards for research and innovation. Professor Ramjugernath is actively involved in a number of initiatives in innovation, commercialization and entrepreneurship nationally.